The good thing about pre-painted terrain pieces is that they can be used straight from the box—that's probably the main reason you bought them. With a small amount of time and effort however you can quickly tailor them to match your current scenery collection through the addition of flock or other scenic material. 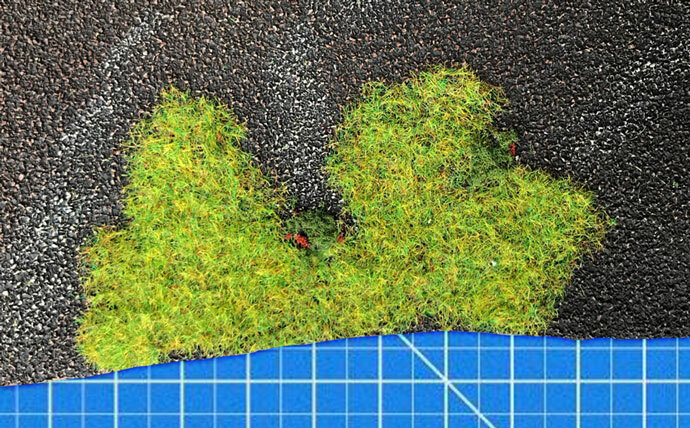 It is important to use the same static grass or flock on your terrain pieces as you use on your gaming table, or as close a match as possible. This is the main reason the terrain sets are supplied unflocked. The paint colour will make a difference as well, but in my experience flock colour is the biggest factor. 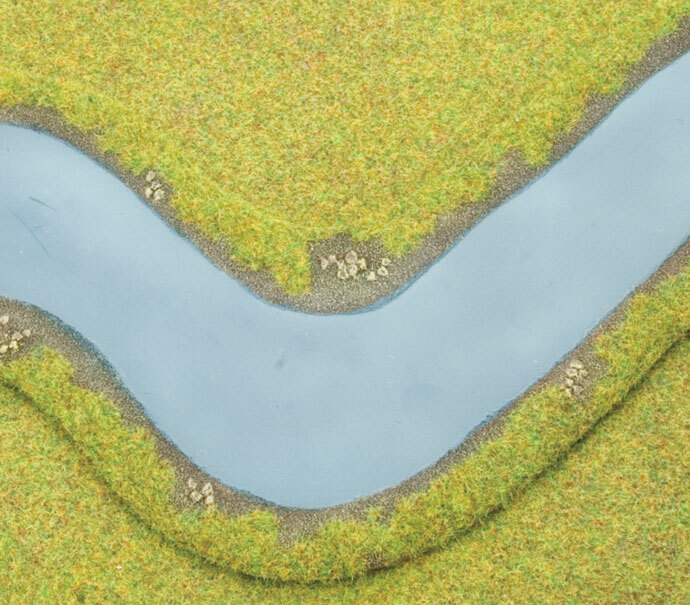 So, although you should ideally paint the edges of your terrain pieces to match your table, it is also perfectly acceptable to skip this step if you wish. Above: A single matching colour looks more unified and appealing. Everyone has their own ideas about the best way to apply static grass. Some people sprinkle it using a flour shaker, or specially designed puffer. Some people use the static charge from their TV, or balloons, or even nifty negative-ion generators to stand the grass up perfectly vertically. I like to carefully place small patches of grass by hand or using tweezers, then tap or blow away the excess, which generally stands the remaining grass up quite well. Not every 'blade' of grass will stand straight up, but nor does that happen in nature. 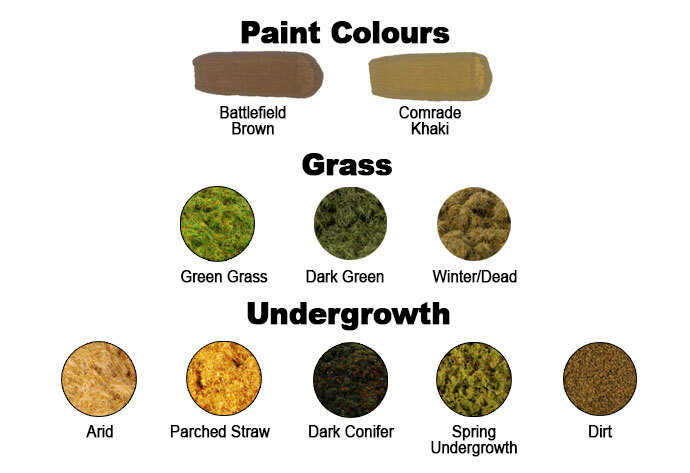 Take a good look at any large patch of real grass, and you will see that it doesn't usually consist of one solid colour. For example, grass doesn't simply stop neatly when it meets a road or hedge – there is often a fringe of dry, dead-looking growth. Emulating this with a thin border of dead-coloured static grass or flock can give a much more realistic appearance. Different colours of static grass and flock can be mixed and blended, like paint, and this allows you to create exactly the colours you want. It also allows you to create subtle transitions between areas of different colour. Above: Can’t find the exact colour you need? Mix your own. Remember, following some kind of real-life reference, whether it be photographs or the actual landscape around you, will always give a better result than simply relying on your imagination. After the glue has thoroughly dried and you have shaken, tapped, blown or brushed away the excess grass, you may find you are left with more sparse or bare patches than you wanted. It is easy enough to go back and fill gaps with a blob of glue and a dab of grass. This tends to create a sort of clumpy, wild effect, but that is really only a bad thing if you are trying to model a golf course. You can also use this technique to cover the small vertical edges of your terrain piece, which are usually left bare after the main application of flock. This helps to conceal the edges, so the piece doesn't stand out from the table quite as much. Roughly paint the edges of your wood’s main base to match your gaming table. 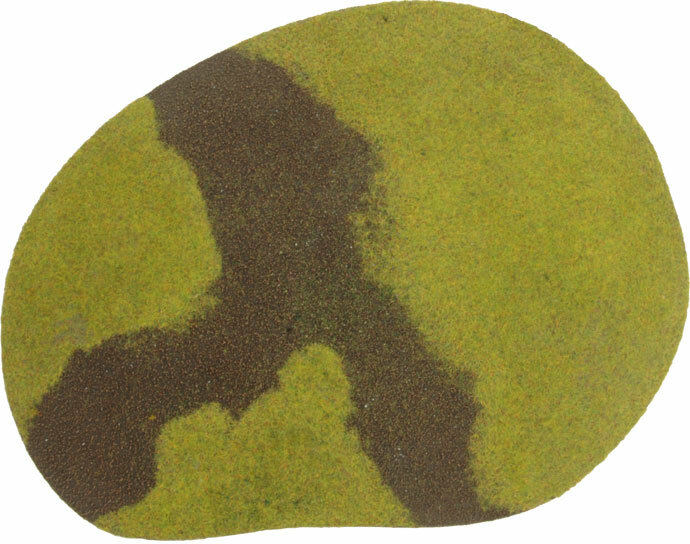 Edge the base with – you guessed it – the same static grass as your gaming table. 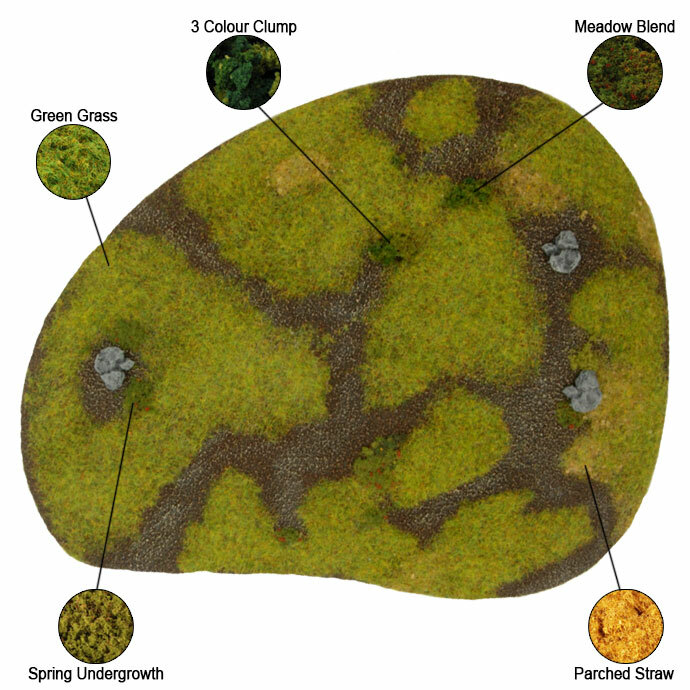 In the centre of the base, however, you can really go to town with different colours and textures of undergrowth. As well as commercial flocks, you can use dried herbs or even real dead leaves, carefully ground up. Remember to try to keep the height reasonably level, so your tree stands will sit flat. 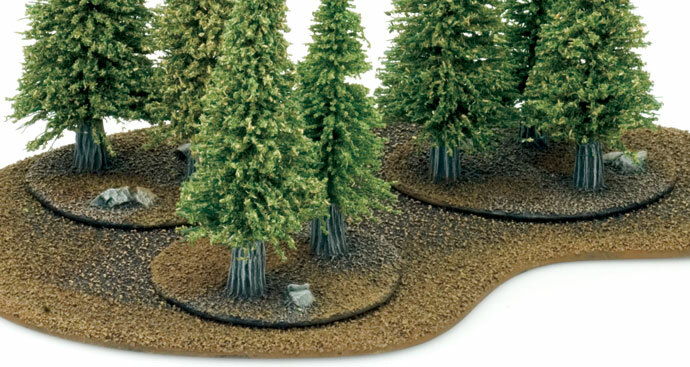 Apply similar undergrowth to the individual tree bases, so they appear part of the wood (see example above). 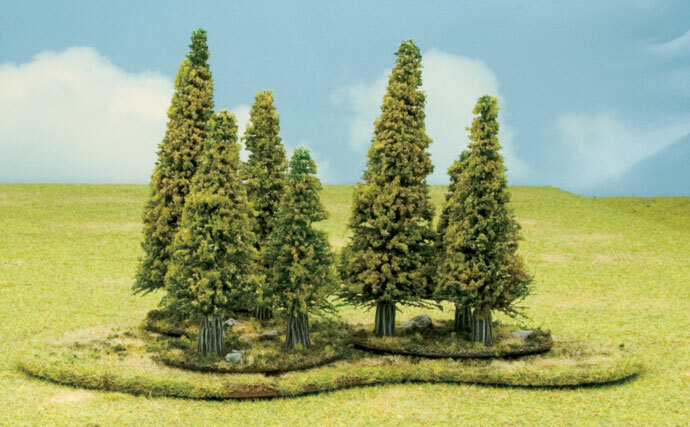 The trees themselves already have a modest covering of flock, but you might want to jazz it up. 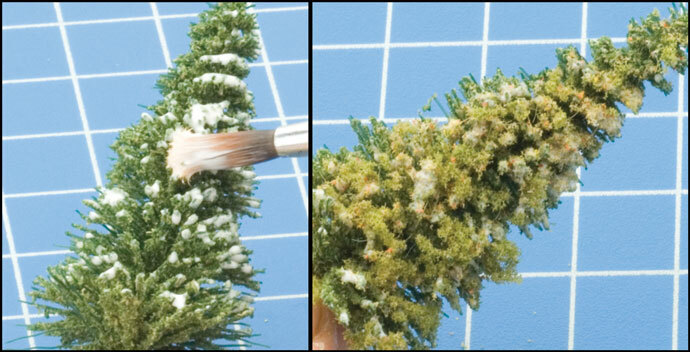 Simply brush on a little white glue, then roll the tree in some flock or sprinkle it on carefully (see example below). 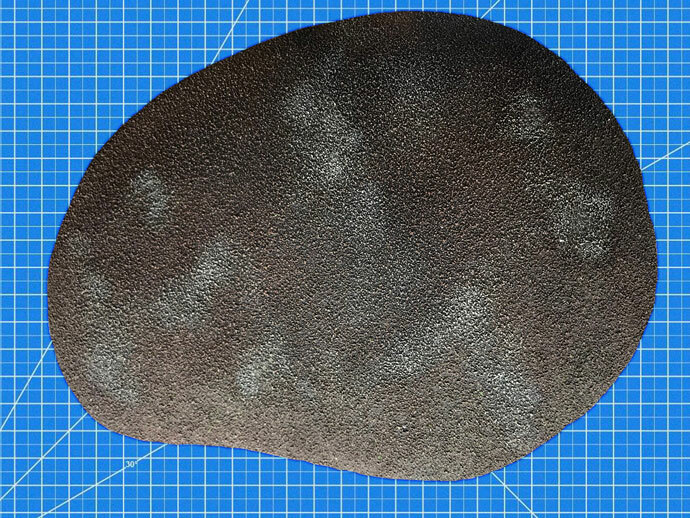 Just like in the example above you can paint the edges of the hill to match your gaming table, or leave them as is (like in the example below). Next you can drybrush areas of the hill in a lighter brown and/or bone white colour. This will help to further enhance areas that you do not flock. Begin applying flock in patches. Don’t attempt to flock the entire hill in one go as you want to make sure you leave enough bare patches for later. Create areas of dead grass, shrubs and bushes by adding patches of flock or clump foliage. By blending together some of the flock you have used on your table, along with another colour (such as Winter/Dead, Arid, or Parched Straw Static grass you can create a subtle but effective result. The blending also helps to create transitions between the colours. Add some rocks or rough ground. You can use GF9 Basing Grit if you want specific sizes, or alternatively you can have a look outside. 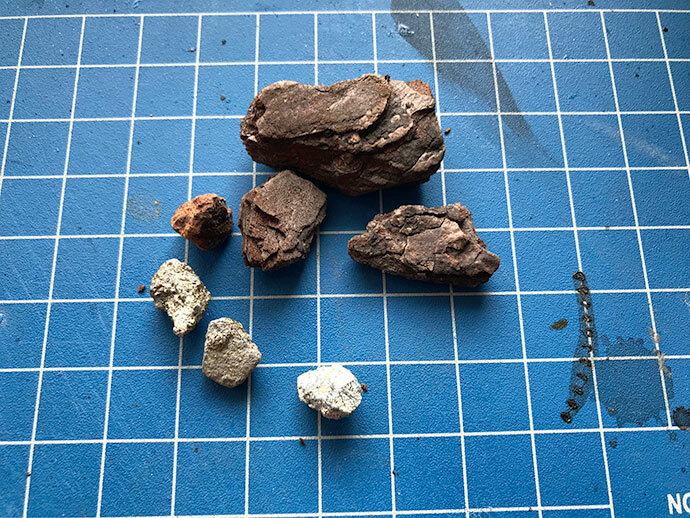 Rocks and pieces of bark are excellent once painted dark grey and then given a drybrush (or two) with lighter colours. Once painted and left to dry you can glue these on to the hill. As you can see, I’ve managed to make this Rolling Hill blend in with the table as well as looking a little more interesting. Like all hobby projects I’d suggest experimenting with some flock combinations, perhaps on a piece of cardboard. Once you are happy it is easy to then enhance an entire table worth of terrain in a short amount of time. Looking at the hill from the top down, you can see where I have applied each of the various flocks I've chosen to use. Alternatively, you can just apply the same colour flock that you have used on your table for a quick but effective result. 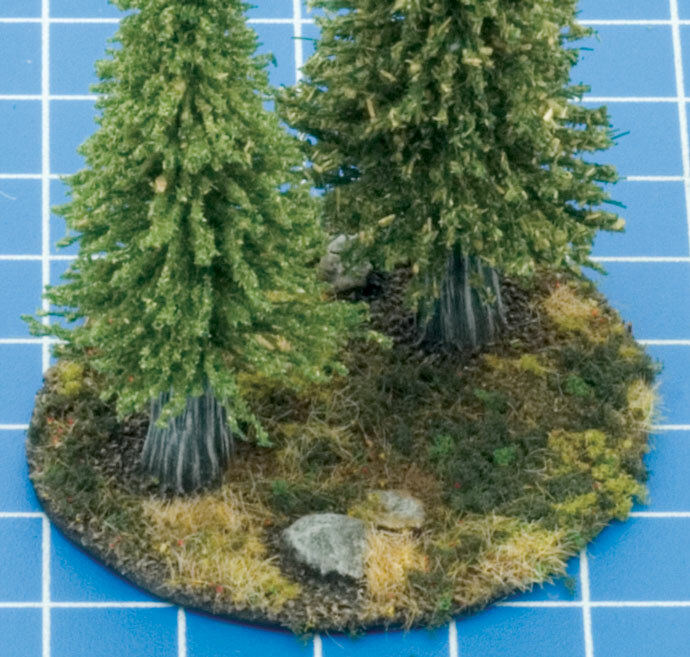 With a few hours' work, it's not hard to turn your terrain sets into an eye-catching scenery collection which will give you years of happy gaming.